“Sustainability” is the latest buzz word in academic and environmental circles. Now it is also buzzing around the halls of the Pentagon. As the long wars in Iraq and Afghanistan run out of rationalizations and public patience, two staff officers working for the Joint Chiefs of Staff have developed a new twist on selling national security to the American people. This unofficial report by two serving officers was soon widely broadcast by The New York Times, not to mention picked up by war critics and spread around the Internet via Facebook and buzzing bloggers. Unlike the “Pentagon Papers” and other in-depth reports on how the US got entangled in controversial military campaigns such as in Vietnam, that continued to grind on long after the loss of public support, this report offers few specific examples of why America’s armed forces need to change the current military way of life. It simply cuts to the chase and flatly states it is time to make major changes. “It is time for America to re-focus our national interests and principles through a long lens on the global environment of tomorrow,” wrote Mykleby and Porter in a report that deliberately echoes the historic 1947 article in Foreign Affairs by Foreign Service Officer George Kennan that formed the basis of the containment strategy that guided US policy toward the Soviet Union for decades. “It is time to move beyond a strategy of containment to a strategy of sustainment (sustainability),” the career military officers wrote in an authoritative summary of a new wave of rethinking the military’s mission apparently coursing through the Pentagon. The New York Times duly noted that the two officers are special strategic assistants to Admiral Mike Mullen, the chairman of the Joint Chiefs of Staff. “We must recognize that security means more than defense, and sustaining security requires adaptation and evolution,” they continued. 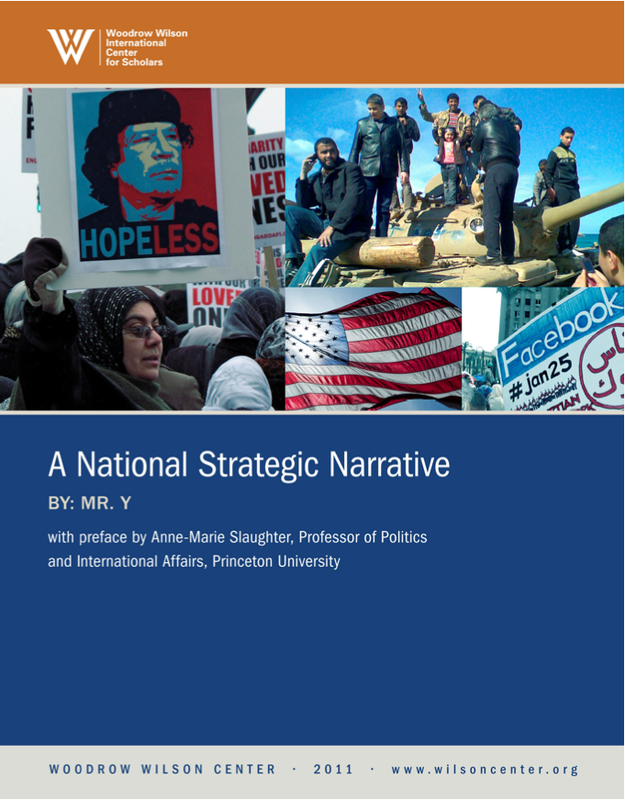 What that means was spelled out in a preface to this report by Anne-Marie Slaughter, a Princeton professor of international affairs who recently stepped down as director of policy and planning at the US State Department. And so the staff officers came up with a way of framing the tenor of these speeches into a new national security strategy. Their mission, apparently, is to stir up public discussion of these ideas outside the usual military-oriented circles. Porter, for instance, co-wrote an op-ed published in The Washington Times in March calling for creation of a National Service Academy to train “a corps of civilian experts” to work on diplomacy and sustainable development projects around the world. “Forging these tools to deliver credible influence worldwide, as part of a comprehensive strategy to sustain the growth of America’s prosperity and to enhance our security, requires an investment in education and in Americans with a proven desire to serve. Too often, we have turned to our military to provide this service,” Porter wrote. Mykleby meanwhile took the new strategy message on the road and addressed the Kansas City Chamber of Commerce. “We need to pursue our [new] priorities of education, security, and access to natural resources by adopting sustainability as an organizing concept for a national strategy. This will require fundamental changes in policy, law, and organization,” they state, offering a legislative proposal to Congress. In Slaughter’s translation, this brass-hat broadside is a high-ranking acknowledgement that the Pentagon budget and war-fighting mission creep around the world must dramatically shrink to help save the nation from a home-front hollowing out that is destroying American livelihoods and communities. This is a now-hear-this message the public needs to tell Congress.